Award-winning author and illustrator of best-selling children’s books William Joyce was named winner of the 2008 Louisiana Writer Award. He was honored by the Louisiana Center for the Book in the State Library of Louisiana for his extraordinary contributions to the state’s literary heritage exemplified by his body of work. 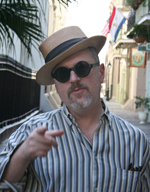 William Joyce was the first children’s author to earn the Louisiana Writer Award. He wrote his first book in the fourth grade. Since then, he has produced award-winning, best-selling classics that are loved by both children and adults. Hailed by Newsweek as one of the top 100 people to watch in the new millennium, William Joyce’s distinct and striking drawings and imaginative storytelling depict a world full of whimsy, fun and adventure - the kind of world a child would want to jump into. In addition to his artistic endeavors, Joyce also is dedicated to giving back to his community. As a native Louisianan, he came to experience first hand the human tragedies wrought by the storms of 2005. In an effort to help his fellow Louisianans, he has used his art in at least two approaches to raise funds for those affected. "Faces of Katrina" was an exhibit that combined the work of several photographers. With the goal of empowering evacuees through photography sessions, the exhibit sought to restore the face of dignity to these evacuees. Joyce also created an original work of art, "Katrinarita Gras." The piece was originally done as a potential cover for The New Yorker magazine. The editors asked Joyce to develop a piece that would epitomize the storms and aftermath. "Coming up with a concept that tempered my rage with some hope was not easy, but I got inspiration from an old photograph of Mardi Gras in the '30s by J. Guttman, called the ‘The Game’. It's a wonderful, eerie image of New Orleans and its curious magic," said Joyce. “Katrinarita Gras” is available at http://stores.ebay.com/Katrinarita-Gras-Foundation. Joyce is an award-winning author and illustrator of such best-selling children’s books as George Shrinks, Santa Calls, Dinosaur Bob and his Adventures with the Family Lazardo, Rolie Polie Olie, The Leaf Men and The Brave Good Bugs and A Day with Wilbur Robinson. In addition to being a recognized figure in the world of children’s literature, Joyce’s illustrations have appeared numerous times on the cover of The New Yorker and his paintings are displayed at museums and art galleries across the nation. Joyce has won three Emmys for his popular children’s show William Joyce’s Rolie Polie Olie, an animated series that airs on the Disney Channel, and he has lent his creative expertise to the feature film world by creating conceptual characters for such films as Toy Story and A Bug’s Life. Joyce’s second television series, George Shrinks, is aired daily on PBS stations across the country. In March 2005 William Joyce released his first major animated feature film entitled ROBOTS with Twentieth Century Fox. Joyce served as both a Producer and Production Designer of this critically acclaimed and commercially successful hit film. William Joyce’s latest film with Disney Feature Animation based on his classic tale A Day with Wilbur Robinson debuted in theatres in March 2007 as Meet the Robinsons. Look for it now on DVD. All of Joyce’s eccentric characters charm children and adults alike with their imaginative adventures. Joyce observes that his upbringing by "a congenial horde of southern screwballs" allowed writing and illustrating to come easily to him. Joyce is a native of Shreveport where he lives with his wife Elizabeth and their children, Jack and Mary Katherine. They have a dachshund named Rose and a canine-like destruction device named Rex. Their school of goldfish recently escaped to waters unknown. The State Library of Louisiana honored Joyce at an award ceremony during the sixth annual Louisiana Book Festival, presented on Oct. 4, 2008. The Louisiana Writer Award is given periodically to recognize outstanding contributions to the literary and intellectual heritage of Louisiana. Past recipients include poet Yusef Komunyakaa; historian Carl A. Brasseaux; novelists James Lee Burke, Ernest J. Gaines, Shirley Ann Grau, Elmore Leonard; scholar Lewis P. Simpso; and poet William Jay Smith.